Gregory Hartley has served as a full-time director, as well as a consultant, to companies and provided body language and behavioral analysis for print, TV, and radio. Visit MindatWar.com for more information. Maryann Karinch has written eighteen books about business and mental/physical conditioning and has coauthored seven books with Gregory Hartley. Chapter 1: Sorting like a Profiler. Chapter 2: Question like a Polygrapher. Chapter 3: Network like a Spy. The Brain of a Spy. Chapter 4: Interview like an Interrogator. Tools of Interviewing Job Candidates. Behavioral Interview Technique Enhanced (BITE). Turning around a bad meeting. 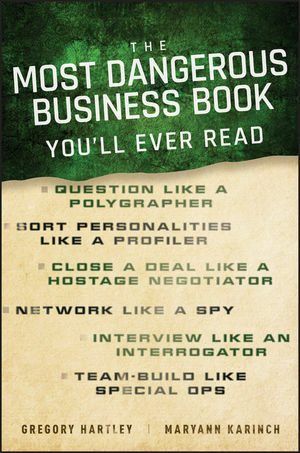 Chapter 5: Close a Deal like a Hostage Negotiator. Reading body language in negotiation. Chapter 6: Research like an Analyst. Chapter 7: Decide like a SEAL. Chapter 8: Team-Build like Special Ops. Conclusion: Backbone or No Backbone.